You can stop skipping dessert, because fashion has some brand new silhouettes in store for winter 2007/08. Size does matter will be the new style motto, taking into consideration the many oversized volumes that were sent up the latest international catwalks. 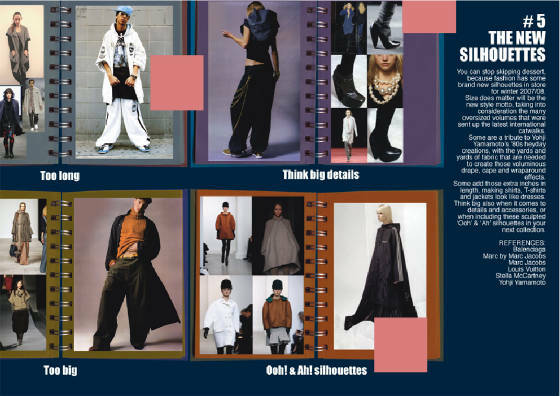 Some are a tribute to Yohji Yamamoto's '80s heyday creations, with the yards and yards of fabric that are needed to create those voluminous drape, cape and wraparound effects. Some add those extra inches in length, making shirts, T-shirts and jackets look like dresses. Think big also when it comes to details and accessories, or when including these sculpted 'Ooh' & 'A' silhouettes in your next collection.